Eric Sykes, CBE, 1923 - 2012, writer, actor and director, worked here. Sykes' family unveiled this plaque just 3 days after the first anniversary of his death. A plaque for Spike Milligan (unveiled by Sykes) was already in situ here. For visibility it would have been better had Eric's plaque been positioned above Spike's rather than below. The two men shared an office at this address for more than 50 years. They were members of Associated London Scripts, a comedy writers’ co-operative. Other members were Frankie Howerd and Ray Galton and Alan Simpson. We note that Milligan's plaque says he 'lived' here, whereas Sykes' says 'worked'. 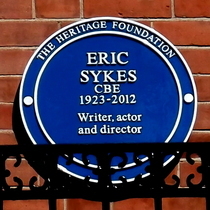 The plaque was unveiled by Eric Sykes. London County Council William Wilkie Collins, 1824 - 1889, novelist, lived here.